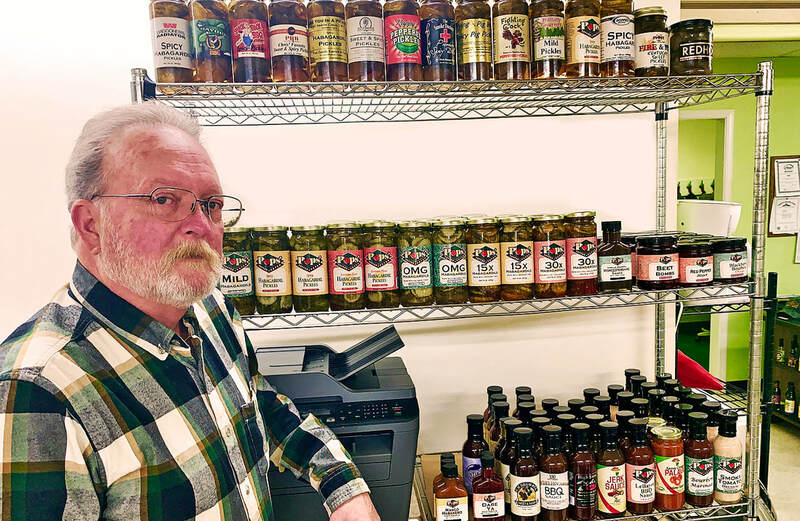 Co-Packer | Sauces-Pickles - Pops' Pepper Patch, Inc.
I’d like to tell you a little about Pops’ Pepper Patch. We’re a small batch food processor founded in 1994. Located in Louisville, KY, we specialize in condiments. Our products range from very mild to unbelievably wild. They include barbecue sauces, hot sauces, salsas, bloody Mary mixers, salad dressings and the best damn spicy pickles you’ve ever had. At Pops' there’s something for everybody’s range of taste and tolerance for spice. A gift of pepper-infused vinegar to my father, Bob "Pops" Kamman, upon his retirement in 1993 is what started it all. He got the fever from that delicious gift of love and started growing peppers of his own along with herbs and thyme. Soon, he was filling bottles and making people happy. And I was helping dad nights and weekends and I loved it. I’ve never seen folks get stirred up like they did when Pops’ added a red pepper jelly to the product line. Suddenly, we were practically a household name. Even the Courier Journal was talking about us. Pops’ had enough by '95. After decades of hard work, he was ready for some rightfully-earned rest and relaxation. He took it. And I took the reins of the Pops’ company. Since then, with my wife’s support, we’ve kept growing, and managed to keep Pop’s legacy alive. Pops' Knows How to Pick ‘em. Today, we process in excess of 60 products for clients in eight states. That’s remarkable growth, and it’s all because the things that Pops’ believed in, himself, that are still here: his commitment to quality ingredients, uncompromising manufacturing procedures and a willingness to put our guarantee behind everything we do. I am not here to take Pops’ place, but, to carry on in his ways. I hope you enjoy our sauces and pickles as much as we enjoy making them. CEO @ Pops’ Pepper Patch, Inc.